Ten years of watching unrealistic scenarios in IEA World Energy Outlooks. “They then realized energy resources are so fundamental to all of civilization, and recognized how vulnerable we are to supply disruptions. Forty years ago in 1974, the International Energy Agency was formed, tasked with keeping an eye on these precious resources, and providing policy makers around the world with information to make better informed planning decisions. It has been reported that the IEA was aware of peak oil as far back as 1998. Researcher Lionel Badal has uncovered the story (a fascinating tale) that the 1998 WEO contained an oil supply graph that included “a balancing item” that they named “unidentified unconventional oil” that conveniently made up for shortages beyond 2010. This was said to have been a code to indicate peak oil. The political fallout that resulted after publication of that report resulted in very conservative WEO reports from 2000 to the present. 2005 was the year world oil production begain its multi-year plateau, after steady increases for many years, and is now regarded by many as the world peak of conventional oil production (see also here). It was also the year The Hirsch Reportwas produced for the U.S. Dept. of Energy, warning that “The peaking of world oil production presents the U.S. and the world with an unprecedented risk management problem,” and that mitigation needed to be implemented 20 years in advance of the peak.” In 2005, peak oil was still seen as a pretty fringe idea. The then executive director of the IEA, Claude Mandil dismissed the idea of peak oil out of hand and stated confidently that “Hydrocarbon resources around the world are abundant and will easily fuel the world through its transition to a sustainable energy future.” [International Energy Agency, 2005. Resources to Reserves: Oil and Gas Technologies for the Energy Markets of the Future, page 3. IEA, Paris, quoted by G. Monbiot, http://www.monbiot.com/2008/12/15/at-last-a-date/]. In the 2005 WEO, Oil demand by 2030 was projected to be 120 mb/d. This article reinforced my already existing opinion that 1) The WEO is written by committee, and represents numerous interests, resulting in reports that tend to favor conservative statements, and 2) that political influence also strongly tempers what is allowed to be conveyed in these reports. Reading the Executive Summaries, one often gets there are competing, sometimes contradictory ideas vying for predominance. These reports, therefore, have to be read with a grain of salt, and a careful eye to read between the lines. What keeps me coming back to these reports each year is this tracking of the changes to their statements over time – mostly in the direction of increased pessimism. Nevertheless, New Policies now becomes the reference scenario in the WEO, andoil demand is projected to reach 99 mb/d in 2035 under this scenario (down from 105 mb/d by 2030 in 2009). To get to those 99 mb/d, the report sees OPEC needing to boost its output by over one-half, with Iraq tasked with “a large share” of that increase. Non-OPEC oil production is expected to be held broadly constant by unconventional oil production and natural gas liquids (NGL), which will then start to drop at the end of the period. The report then offers another disclaimer: “The size of ultimately recoverable resources of both conventional and of unconventional oil is a major source of uncertainty for the long-term outlook for world oil production.” For me, it does not inspire much confidence to be putting our hopes for a growing supply of oil for the next 20 years on the Middle East, especially when the bulk of it must come from Iraq. According to the report, 40% of oil production in 2035 will need to come from fields not yet found. Permission is granted to jump to the end of this post to see the 2014 graphshowing a decline in unconventional oil produced by Brazil, Canada, and the U.S. well before the 2030s. In June of this year (2014), I wrote a post titled New Energy Report from I.E.A. Forecasts A Decline in North American Energy Supply about a special report titledWorld Energy Investment Outlook. I noted the dramatic shift in stance and in tone from 2012, when the agency forecast that the U.S. would overtake Saudi Arabia in oil production by 2020, and that North America would be a net oil exporter by 2030. Now they were telling us that output from North America will plateau and then fall back from the mid-2020s onwards. 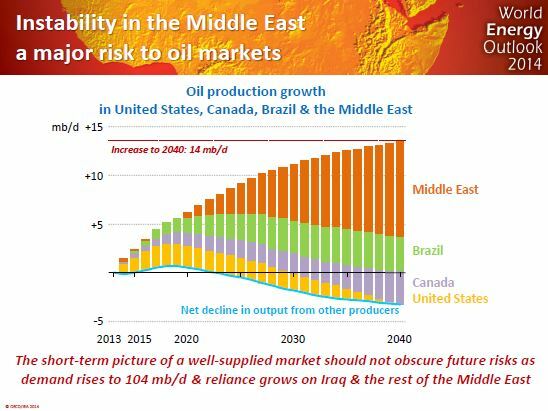 Note the graph below, taken from the slideshow accompanying the press releaseof this report, which shows declining output in the U.S. before 2020, and the enormous burden placed on Iraq and a small number of other Middle East countries after 2020 to make up both the shortfall from declines everywhere else, plus meeting expected demand – regardless of the instability in the Middle East, isn’t this conventional oil that the 2010 report told us had peaked in 2006? The IEA is becoming increasingly more realistic as they move beyond demand driven scenarios, and acknowledge that the era of easy oil is over. The alternatives we are left with are becoming increasingly expensive – from unconventional fossil fuels like tar sands and shale plays, to renewables. However, at some point (a point we may have already passed), geology responds less and less to the human construct we call money. We’re currently living at the high point of thefossil fuel Pulse, and I don’t believe we can negotiate an avoidance of the backside of the pulse’s decline – but we can take measures to make a graceful descent if we begin early enough (ten years ago). Finally, if you’re wondering about the current decline in oil prices (I planned to cover it more in this piece, but ran out of space and time), check out Ugo Bardi andGail Tverberg.